Allinson Gallery. I've Been Framed!. I've Been Framed! : Framed fine prints, drawings and watercolors. John Taylor Arms, N.A., R.E. 1887-1953. La Bella Venezia, or The Grand Canal, Venice. 1930. Etching. Fletcher 232. 7 1/8 x 16 1/2 (8 3/8 x 17 1/2. Italian Series, #18. Trial proof, apart from the edition of 81 (+ 5 trial proofs). Illustrated: Dorothy Noyes Arms, Hill Towns and Cities of Northern Italy, p. 192; Eric Denker, Reflections & Undercurrents: Ernest Roth and Printmaking in Venice, 1900-1940, A rich impression with subtle tonal wiping printed on cream wove paper. Signed, dated, titled and annotated and 'trial proof II', 'collection j' (Hugh Fisher, England), and 'ct' (Carling trial) in pencil. Housed in a 15 1/4 x 24 1/8-inch gold leaf frame. $3,500. Rio del Santi Apostoli, Venice. 1930. Etching. Fletcher 226.ii. 8 x 6 (sheet 9 3/4 x 14 1/4). Edition 100 (+ 10 trial proofs). Italian series #4. Illustrated:Dorothy Noyes Arms, Hill Towns and Cities of Northern Italy, p. 206. Commission as the frontispiece for the limited edition of American Etchers: John Taylor Arms. A rich impression, one of 18 printed by Henry E. Carling on antique cream laid paper with a shield watermark. Signed, dated, and annotated ' Plate etched as frontispiece for Limited Edition of Volume V of American Etchers Series' and 'cp' (Carling printed) in pencil. Housed in a 16 1/4 x 13 3/4-inch Italianate gold leaf frame. $2,250. Artists Judging Works of Art. 1916. Lithograph. Mason 18. 14 1/2 x 19 (sheet 18 3/4 x 26 7/8). Edition aproximately 52. A rich impression printed on Japanese mulberry paper, on the full sheet with deckle edges. This is a fine lifetime impression. Provenance: H.V. Allison and Co. Inc., New York; Chapellier Galleries, Inc, New York; Galleries Marcus Steinberg, Chicago. Gift to a Texas collector. Signed, titled and annotated 'No. 25' in pencil by the artist. Housed in a 29 x 33 1/2-inch reproduction gold leaf period frame. $10,000. Tennis (Tennis Tournament). c. 1921. Lithograph. Mason 71. 18 3/8 x 20 (sheet 20 x 21 3/8 ). Edition probably 63. A rich impression printed on chine appliqué mounted on plate paper, as issued. This is a fine lifetime impression. Signed, annotated 'imp' and numbered '6' in pencil by the printer, Bolton Brown; signed and titled in pencil by the artist. Housed in an elegant 33 x 34 1/2-inch reproduction period gold leaf frame. $15,000. The Tournament (Tennis at Newport). c. 1921. Lithograph. Mason 72. 14 3/4 x 18 7/8 (sheet 20 1/2 x 24). Edition probably 63. A rich impression printed on chine appliqué; mounted on plate paper. Signed, annotated 'imp' and numbered '42' in pencil in pencil by the printer, Bolton Brown; signed in the stone and in pencil by the artist. Housed in an elegant reproduction period 29 1/2 x 32 1/4-inch gold leaf frame. $15,000. Looking into the Hand Mirror, No.3. c. 1905. Drypoint. Breeskin 202+. 8 1/4 x 6 (sheet 10 1/2 x 7 1/8). Posthumous impression. Printed on antique laid paper. Housed in an elegant archival French mat and a 17 1/4 x 15-inch style gold leaf frame. $2,250. Illustrations for Philip Wylie, "The Paradise Crater," Blue Book Magazine, volume 81, #6, October 1945. [Futuristic Helicopters.] c. 1944. Conte crayon drawing. 9 1/2 x 7 (framed 15 7/8 x 13 3/8). Illustration for the text: Illustration for the text: 'The world was at peace and prosperous' in the article by Philip Wylie, "The Paradise Crater," Blue Book Magazine, volume 81, #6, October 1945, page 13. Initialed, lower right. Housed in a 17 5/8 x 13 3/8-inch mondern black metal frame. $850. [Futuristic Aircraft.] Conte crayon drawing. 11 1/4 x 7 (framed 17 3/8 x 13 1/8). Illustration for the text: 'They put behind them Russia and Italy, the Mediterranean and Africa, South America and the Caribbean' in the article by Philip Wylie, "The Paradise Crater," Blue Book Magazine, volume 81, #6, October 1945, page 19. Initialed, lower center. Housed in a 17 5/8 x 13 3/8-inch mondern black metal frame. $850. Skyscrapers. c. 1950. Pastel on illustration board. 29 3/4 x 19 7/8 (framed 37 x 27). Provenance: Lewis A.Shepard, Mr.and Mrs. Archie Burack, The New Britain Museum of American Art, New Britain, Connecticut. Signed, lower right. Price upon request.ably 63. A rich impression printed on chine appliqué; mounted on plate paper. Signed, annotated 'imp' and numbered '42' in pencil in pencil by the printer, Bolton Brown; signed in the stone and in pencil by the artist. Housed in a reproduction period gold leaf frame (29 x 32 1/2). $15,000. Harold Kerr Eby, N.A. 1890-1946. September 13, 1918. St. Mihiel [The Great Black Cloud]. 1934. Etching, aquatint and sandpaper ground. Giardina 182.iv. 10 3/8 x 16 (sheet 13 1/8 x 18 1/4). Edition 100. Illustrated: Prints vol. VI, no. 2, 1935, page 85; Print Collector's Quarterly 26 (1939): 82; Fine Prints of the Year, 1935; Eby. War. Provenance: Frederick Keppel & Co. A rich, beautifully wiped impression on cream-colored wove paper. Signed and annotated 'imp' and 'Edition 100' in pencil, indicating a proof printed by the artist. This is Eby's most famous etching. Housed in a an archival French mat and a 21 x 25-inch black and gold classical wood frame. Price upon request. The Bill Boards, New York. c. 1919. Etching. Cortissoz, Clayton 87. 4 5/8 x 6 (sheet 6 3/8 x 9 5/8). A fine impression with carefully-wiped plate tone printed on white wove paper with deckle edges. Drying tack holes in the margins. Provenance: William Macbeth Gallery, New York. Signed and dated 1896 in the plate; signed with the cypher in pencil. Housed in an elegant beaded gold leaf frame. $6,000. The Writing Desk. 1915. Etching. Clayton 54. 10 x 7 (sheet 12 314 x 9 5/8). Tack holes in the margins as usual, indicating that the sheet is untrimmed. A fine impression printed on cream paper with full margins and deckle edges on 3 sides. Signed with the cypher and annotated 'imp' in pencil signifying a proof printed by the artist. Housed in a silk mat with a gold liner, within a 22 1/2 18 1/2-inch 22 karat gold leaf frame. Price upon request. Night Shadows. 1921. Etching. Levin 82. 7 x 8 3/8 (sheet 10 x 13 7/8). Series: Six American Etchings: The New Republic Portfolio, 1924. Edition approximately 500-600. A rich impression printed by the master printer, Peter Platt, on Van Gelder wove paper with full margins. Signed in pencil. Housed in a 15 1/2 x 17-inch silver/gold modernist style frame. Price upon request. Her Bit. 1918. Color etching. Mason and Mason 140. 6 7/8 x 4 7/8 (sheet 10 3/4 x 7 13/16). Signed numbered '34.' in pencil. A rich impression with glowing colors, printed on Japanese mulberry paper with full margins. Housed in a frame with patriotic motifs of an eagle with shield and American flags. A unique presentation of a child doing 'her bit' by knitting for the soldiers. $1,750. Quarter of Nine, Saturday's Children. 1929. Drypoint. McCarron 78. 9 3/4 x 12 3/4 (sheet 12 7/8 x 17 7/8). Illustrated: American Etchers: Martin Lewis. Edition 107. A fine impression printed on Swedish cream wove paper with full margins. Signed and annotated "imp" in pencil, indicating a proof printed by the artist. Housed in a 19 3/8 x 21 3/8 1-inch black stepped wod frame. $35,000. Spring Night, Greenwich Village. 1930. Drypoint and sand ground. McCarron 85. 10 x 12 3/8 (sheet 13 1/4 x 15 5/8). Edition 92. A rich, tonal impression printed on laid paper. Signed in pencil. Housed in a 21 x 22 1/2-inch gold and silver Art Deco style frame. Signed in pencil. $27.000. Stoops in Snow. 1930. Drypoint and sandpaper ground. McCarron 89.ii. 9 3/4 x 14 3/4 (sheet 13 7/16 x 18 7/16 ). Edition 115 recorded impressions. Illustrated: American Etchers: Martin Lewis. A rich, tonal impression printed on white laid paper with full margins. Signed in pencil. Housed in a stunning archival black mat and a 20 x 24 3/4-inch modernist black wood frame. $42,500. 57th Street (Rubber Center). 1930. Lithograph. Flint 26. 14 3/4 x 7 1/2 (sheet 15 7/8 x 11 3/8). Edition 40, #12 . A rich tonal impression printed by George C.Miller on the full sheet of 'BFK' (Rives) wove paper. Provenance: Graphics International, Washington, D.C. Signed, dated and numbered in pencil. Price upon request. Housed in a silver and gold modernist style frame. League Print. 1949. Engraving. Sasowsky 234. 9 7/8 x 8 (sheet 12 1/2 x 9 7/8). Edition 200 for the Art Students League of New York. A fine impression printed on white wove paper with full margins. Signed in pencil. Available in a silver wood frame. $2,000. Coronation of King George V and Queen Mary in Westminster Abbey. June 22, 1911. 1911. Lithograph. Wuerth 197. 21 x 16 (sheet 25 1/8 x 20). Edition about 30. A fine impression printed on cream wove paper. An extremely scarce and important historical image. Signed in pencil. Housed in an elegant 20 x 24-inch Hogarth-style black wood and gilded frame with gilded corner ornaments. $2,250. September Morning: The First Ferry. 1929. Watercolor. 10 1/8 x 13 (image and sheet). Provenance: The Fine Art Society, London. A misty, impressionist watercolor on French papier vedâtre. Titled and dated '29' verso. Signed in pencil, recto, lower right. Housed in the original 19 1/8 x 232 5/8 gold leaf frame. $6,500. Kraushaar's. 1926. Etching. Morse 29.viii. 3 7/8 x 5 15/16 (sheet 7 x 11 1/16). A rich impression printed on Japanese bulberry paper with wide margins. 3 7/8 x 5 15/16). Annotated 'Erndst Roth imp' in pencil, lower left. Signed, title and annotated '100 proofs' in pencil by Sloan. Signed, titled and annotated '100 proofs' in pencil by the artist. Housed in a 14 1/2 x 1`5 1/2-inch modernist silver and gold frame. $2,500. The Little Bride. 1916. Etching. Morse 138. 4 7/8 x 6 3/4 (sheet 7 7/8 x 10 1/2). Series: New York City Life, tenth plate.Printed on cream wove paper with full margins. Exhibited: Panama-Pacific International Exposition, San Francisco, 1915. Illustrated: Charles Wisner Barrell, 'The Real Drama of the Slums as told in John Sloan's Etchings' The Craftsman vol. 15, p. 560. Signed and annotated "Ernest Roth Imp' by the printer. Signed, titled and annotated '100 proofs' in pencil by Sloan. Housed in a gold beaded and carved 14 x 14 1/2-inch frame. $2,200. Etchings: Family and Friends. 1857-1904. Jo's Bent Head. 1861. Drypoint. Kennedy 78.ii; Glasgow 88.ii/iii. 9 x 5 7/8 (sheet 12 7/8 x 9 1/4). Glasgow records 25 known proofs. A rich impression with subtle tonal wiping, printed on fine cream laid paper with a 'No>1' countermark. There was no published edition of this extremely rare etching. Unsigned. Housed in an archival French mat and a 19 x 15 1/2-inch period beaded gold frame. $9,750. The Wine Glass. 1859. Etching. Kennedy 27.ii; Glasgow 38.ii. 3 1/4 x 2 1/4 (sheet 5 7/8 x 4 3/8). There was no formal edition of the plate; Glasgow records only 39 known impressions. A well-inked, beautifully wiped impression printed on cream laid paper. Signed in the plate. Price upon request. Available housed in a reproduction Whistler gold leaf frame. Liverpool London and the Thames. 1859-1879. Dipping the Flag. 1877. Etching and drypoint. Kennedy 325; Glasgow 308.iii(?)/iv. 3 1/8 x 6 5/8 (sheet 8 1/2 x 13 1/4). Dipping the Flag formed part of the 'Jubilee ' alternatively 'Naval Review' set. Unique proof printed in red brown ink with tonal wiping on sturdy ivory paper. Signed with the butterfly in pencil. Price upon request. Housed in an archival French mat and a 13 x 17-inch reproduction gold leaf Whistler style frame. $13,500. Longshore men. 1859. Drypoint. Kennedy 45; Glasgow 52.iv. 5 7/8 x 8 3/4 (sheet 9 1/16 x 13 1/8). Glasgow records 37 known impressions. Two unobtrusive printing folds; otherwise good condition. A rich impression printed with plate tone on sturdy Japanese mulberry paper. Signed 'Whistler' and dated '1859' in the plate. A rich impression printed with plate tone on sturdy Japanese mulberry paper. Signed 'Whistler' and dated '1859' in the plate. Housed in a 17 x 21 1/2-inch black wood frame with a Whistler nameplate. $3,500. Rotherhithe (Originally published as Wapping). 1860. Etching. Kennedy 66.iii; Glasgow 70.vi. 10 3/4 x 7 3/4 (sheet 12 7/8 x 9 1/2). Series: "Sixteen Etchings or Scenes on the Thames and Other Subjects." (Thames Set) plate 5. Illustrated: Guichard, British Etchers, 1850-1940; Keppel, The Golden Age of Engraving; Salaman, The Great Painter-Etchers from Rembrandt to Whistler and Modern Masters of Etching: Whistler; Guichard, British Etchers, 1850-1940. One 2-mm missed inking spot between the two ship masts on the right; otherwise an excellent proof. A rich impression printed on antique cream laid paper. Signed in the plate. Housed in an archival silk-covered mat with a gold lip in an elegant 19 5/8 x 16 5/8-inch Whistler style gold leaf frame. $10,000. The French Set and Paris. 1857-1891. Bibi Lalouette. 1859. Etching and drypoint. Kennedy 51.ii; Glasgow 33.ii. 9 x 6. Glasgow records 67 known impressions. A fine impression, printed with tone and showing velvety burr from the drypoint work, especially in the boy’s hair and coat. In the first state there were two heads in the lower part of the plate. They were removed and Whistler turned the plate upside down; however, one head remains visible in this impression. Printed on fine cream laid paper. Signed and dated in the plate. Housed in a silk mat and gold leaf frame. $4,250. 1859. Etching and drypoint. Kennedy 51.ii; Glasgow 33.ii. 9 x 6. Glasgow records 67 known impressions. A fine impression, printed with tone and showing velvety burr from the drypoint work, especially in the boy’s hair and coat. In the first state there were two heads in the lower part of the plate. They were removed and Whistler turned the plate upside down; however, one head remains visible in this impression. Printed on fine cream laid paper. Signed and dated in the plate. Housed in a silk mat and 19 x 16-inch gold leaf frame. . $4,250. Fumette. 1858. Etching. Kennedy 13.iv; Glasgow 12.v. 6 3/8 x 4 1/4 (sheet 7 7/8 x 5 3/4). Glasgow records 74 known impressions. Series: Douze Eaux-Fortes d'après Nature(French set). A rich tonal impression in warm brown/black ink on 'Austin' off-white laid paper. Signed in the plate. Housed in an archival French mat and a dramatic 14 x 11 1/2 x 1-inch gold leaf frame. $3,500. Venus. 1859. Etching and drypoint. Kennedy 59.ii; Glasgow 60.ii. 6 x 9 (sheet 8 x 11 3/16). Glasgow records 27 known impressions. A very rich impression printed in black ink on fine Japanese mulberry paper. Provenance: estate of Alvin B. Glaser Signed and dated in the plate. Housed in an archival French mat and a 14 x 11-inch gold leaf frame. $35,000. The Venetian Mast. 1879-80. Etching and drypoint. Kennedy 195.vi; Glasgow 219.x/xii. 13 3/8 x 6 3/8. Series: First Venice Set 1880. Glasgow records 53 impressions. 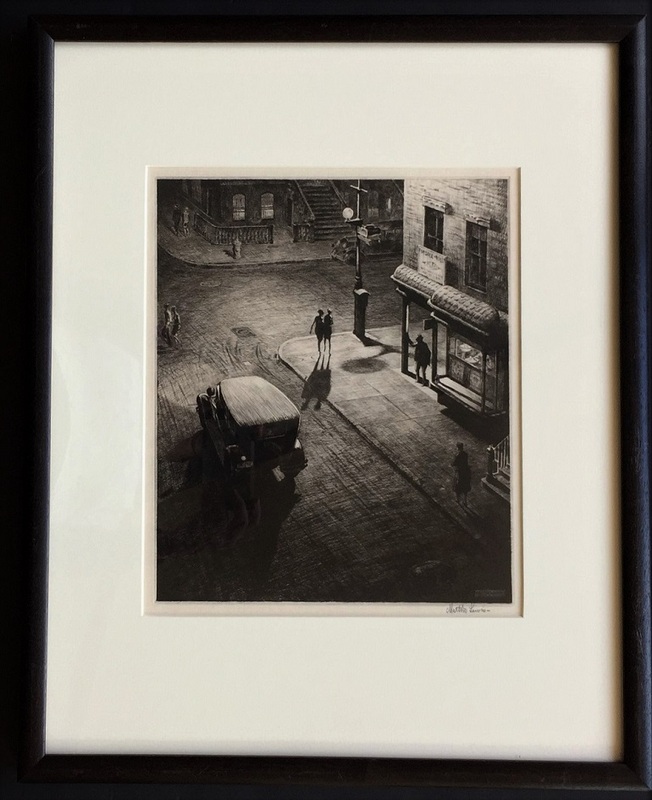 A fine, atmospheric proof of this rare image, printed in black ink on fine laid paper. Signed with the butterfly in the image and annotated 'imp' on the tab in pencil by Whistler. Housed in a 21 x 13 1/2-inch pale gold wood frame. $12,500. The Little Wheelwright's. 1886. Etching. Kennedy 245; Glasgow 242. 2 1/2 x 3 3/4 (sheet 5 1/8 x 6 1/8). There was no lifetime edition. Glasgow lists only 13 other known impressions. A fine impression printed in black ink on white laid paper. Monogrammed with the butterfly in the plate. Housed in an archival French mat and a gold leaf period carved Celtic design frame. $3,000. Newspaper Stall, Rue de Seine. 1893. Etching and drypoint. Kennedy 432.ii; Glasgow 474.ii. 3 3/16 x 7 13/16 (sheet 7 7/8 x 12). Glasgow records 13 known impressions. A very rich impression in warm brown/black ink printed on cream antique paper with a coat of arms with a tower watermark. Signed with the butterfly in the plate, upper right. Housed in an elegant carved gold frame. $3,750. Afternoon Tea. 1897. Lithograph. Way 147; Levy 224; Tedeschi, Stratis and Spink 173. 7 1/2 x 6 (sheet 14 13/16 x 9 9/16). Edition 100 printed by Clot, issued by Ambroise Vollard in L'Album d'estampes originales de la Galerie Vollard (second album, Paris 1897). A rich impression printed on the full sheet. Monogrammed in the stone. Housed in an archival mat with a silver liner, and an elegant 18 1/4 x 16 3/4-inch silver leaf frame. $2,750. La Jolie Newyorkaise. (The Lovely Lady from New York). 1894. Lithograph. Way 61; Levy 92; Tedeschi, Stratis and Spink 99. 9 x 6 1/4 (sheet 15 x 10 1/8). Edition 30 printed by Way, and 30 printed posthumously by Goulding November 2, 1903. A fine impression printed from the later edition on the full sheet of 'O.W.P. & A.O.L.' laid paper. Collector's seal verso: Rosalind Birnie Philip (Lugt 405). Monogrammed with the butterfly in the stone. Housed in an archival French mat and a delicate 22 x 18-inch gold leaf frame. $3,500. La Robe Rouge. (The Red Dress.) 1894. Lithograph. Way 68, Levy 96, Tedeschi, Stratis and Spink 107.ii. 7 1/2 x 6 (sheet 11 1/2 x 8 1/8). As published in The Studio, London, with their blindstamp, lower left. A well-inked impression printed on cream wove paper. Monogrammed with the butterfly in the stone. Housed in a silk mat with a gold lip in a 19 1/8 x 15 1/2-inch gold leaf frame. $1,750. Tête-à-Tête in the Garden. 1894. Lithograph. Way 54, Levy 85, Tedeschi, Stratis and Spink 90. 8 x 6 1/2(sheet 10 7/8 x 8 1/2). Edition of 25 lifetime impressions plus a few proofs recorded by Way (Goulding printed 30 posthumous impressions in 1904, after which the stone was erased). A foxing spot, otherwise excellent condition.Printed on ivory laid paper from an antique volume, numbered 178 recto and 177 verso, lower right. A well-inked lifetime impression of this extremely scarce print. Signed with the butterfly in the stone. Signed with the butterfly in the stone. Housed in an archival French mat and a dramatic 18 1/2 x 16 1/4-inch gold and black frame with a subtle gray lip. $6,500. Unfinished Sketch of Lady Haden. 1895. Lithograph with scraping. Way 143; Levy 139; Tedeschi, Stratis and Spink 116.ii/iii. 11 13/16 x 7 7/8 (sheet 13 5/16 x 9 3/8). No published edition; Way listed 8 impressions. The stone was erased by 1905. An impression with strong contrasts printed on fine laid paper. Monogrammed with the butterfly in the stone. Housed in an elegant French mat and 20 3/8 x 16-inch gold leaf frame.$7,500. Chelsea Rags. 1888. Lithograph. Way 22, Levy 35, Tedeschi, Stratis and Spink 26. 7 1/8 x 6 5/16 (sheet 12 3/4 x 8). Printed on cream laid paper. Provenance: Miss Rosalind Birnie Philip, Whistler's sister-in-law, her seal verso: (Lugt 405). Michael Parkin Fine Art, Ltd. from whom purchased in 1972. Christie's, King Street.Signed with the butterfly in the image. One of 14 impressions listed by Way, before the image was transferred to supplementary stones for the edition of 500-1,000 printed by Way and issued in the Albemarle, January, 1892. Signed with the butterfly in the stone and in pencil. Housed in an elegant silk mat with a silver liner, and in a 16 3/4 x 14 3/4-inch silver leaf frame decorated with fleur-de-lis decorations. $6,500. The Fair. 1895-96. Lithograph. Way 92, Levy 144, Tedeschi, Stratis and Spink 135.ii. 9 1/4 x 6 1/2 (sheet 13 x 9 5/8). A fine impression printed on antique cream laid paper. Way lists 15 lifetime impressions (Goulding printed 30 proofs on April 11, 1904). Collector' seal verso: LDB (not in Lugt). Presumably one of the 15 lifetime impression. Monogrammed with the butterfly above the awning in the stone. Housed in a silver and black frame with a silk mat. A fine impression of this scarce image. $3,500. Victoria Club. 1879 and 1887. Lithograph. Way 11.ii; Levy 22; Tedeschi, Stratis and Spink 15.ii. 8 x 5 3/8 (sheet 16 5/8 x 12 1/16). A rich impression printed on greyish ivory proofing paper mounted on ivory plate paper. Edition of 100 printed by Way and issued by Boussod, Valadon & Co., as published in the portfolio, Notes 1887-88. Monogrammed with the butterfly in the stone. Housed in an elegant 20 x 17-inch beaded silver frame. $2,750. Nursemaids: les bonnes de Luxembourg. 1894. Lithograph. Way 84; Levy 79; Tedeschi, Stratis and Spink 81. 9 x 6 1/2 (sheet 12 1/2 x 9). Edition of about 3,000 published in The Art Journal, December, 1894. A fine impression printed on ivory colored wove paper. Monogrammed with the butterfly in the stone. Housed in a silk mat with a gold lip in a 19 1/8 x 15 1/2-inch gold leaf frame. $1,750. Rue Furstenberg. 1894. Lithograph. Way 59; Levy 90; Tedeschi, Stratis and Spink catalog 97. Only state. 8 7/8 x 6 1/4 (sheet 14 1/4 x 8 7/8). A fine impression printed on cream laid paper with a 'D&C Blauw' watermark of a hunting horn in shield. From the posthumous edition of 37 printed by Goulding in 1903 (Way lists 26 lifetime impressions). Monogrammed with the butterfly in the stone. Housed in a double blue/gray archival French mat and an elegant 20 x 15 1/4-inch gold leaf frame. $3,750. The Smith, Passage du Dragon. 1894. Lithograph. Way 73; Levy 110; Tedeschi, Stratis and Spink 103.i/iii. 11 7/8 x 7 1/2 (sheet 13 x 8 3/8). Edition 34 in three states (additionally, Goulding printed 45 posthumous impressions in 1904). A fine impression of the very rare first state, printed on Japanese mulberry paper. Collector's seal verso, lower left, brown ink, stamped: initial BP in sketchy square: Lugt 406, Rosalind Birnie Philip (lifetime stamp- design by Whistler. Monogrammed with the butterfly in the stone and in pencil. Housed in an archival French mat and an 18 3/4 x 14-inch gold leaf frame. $6,500. Robert Sargent Austin, R.A., P.R.E., P.R.W.S. 1895-1973. A Woman of Scanno. 1926. Line engraving. 7 7/8 x 6 1/8 (sheet 12 3/4 x 10 3/8). Edition 50. Published by the Twenty One Gallery. A very rich impression printed on 'Charles I' laid paper. Illustrated: Salaman, Modern Masters of Etching; Fine Prints of the Year, 1927; Print Collector's Quarterly 16 (1929): 342. Signed and dated in pencil. $450. Another proof framed, $525. Robert Anning Bell, R.A. 1863-1933. Battledore (Girls Playing Tennis). 1896. Lithograph. 10 1/2 x 6 5/8 (sheet 10 3/4 x 7 1/2). Printed in sanguine ink on cream wove paper, as published in The Studio volume 10, 1896, with their blindstamp. Signed and titled in the stone. Housed in a handsome gold leaf frame. A charming tennis image. $325. Amey's Eating House, Winchester. 1916. Pencil drawing.13 x 7 1/2 (sight size). One pinhole on the right-hand edge of the drawing, 3 inches from the top; otherwise fine condition. Provenance: Fine Art Society, with their label, verso. Framed and glazed. Signed, dated and annotated 'Winchester', lower right. $1,750. A Spanish Good Friday (Ronda). 1925. Drypoint. Dodgson 412.xxix. 12 1/2 x 8 1/8 (sheet 16 3/4 x 12). Edition 160 in 29 states. Illustrated: Zigrosser: Six Centuries of Fine Prints. A rich impression with velvety drypoint burr. Printed on smooth simili-Japan paper with full margins. Annotated by Bone 'XXIX A Spanish Good Friday (Ronda) (for Morris) in the lower margin. Signed in pencil by Bone. $7,500. Adolescence. (Kathleen Nancy Woodward). 1932. Etching. Fletcher 75.vi. 14 3/8 x 10 7/16 (sheet 16 3/4 x 13). Total edition 91. Illustrated: Guichard, British Etchers 1850-1940; Fine Prints of the Year, 1933 and and Zigrosser, Six Centuries of Fine Prints. A luminous, richly-inked impression on simili-japon paper. Signed in pencil. This is the artist's magnum opus. It was one of the most influential and familiar icons of erotica of the 1930s. Housed in a 24 3/8 x 20 3/8 Italianate style wood frame. $28,000. Dorette (Kathleen Nancy Woodward). Fletcher 72.iv/vii. 9 1/8 x 7 1/4 (sheet 14 1/2 x 10 1/4). Trial prrof 4, prior to the published edition of 100 (111 proofs in all). Illustrated: Fine Prints of the Year, 1932; Royal Academy Illustrated, 1932; Print Collector's Quarterly 22 (1935): 74. Printed on cream-colored simili-japon paper with full margins.. Signed and annotated '4th state G.L.B.' and '(1 of 3 proofs thus)' and in pencil. Housed in a 22 3/8 x 20 3/8 Italianate style black and gold wood frame. $6,000. Jeunesse Dorée (Kathleen Nancy Woodward). (Gilded Youth.) 1942. Etching. Fletcher 80. 10 7/8 x 8 7/8 (sheet 14 1/4 x 11).Edition 75 in this state (there was also 1 trial and 4 proofs in state I; 2 trials and 2 proofs in state II; and 2 proofs of state 3, plus 4 proofs of the canceled plate) . A very rich impression with subtle plate tone, printed on antique cream laid paper with full margins. Signed and dated in pencil. Housed in a 22 3/8 x 20 3/8 Italianate style black and gold wood frame. $9,500. Arthur Paine Garratt. Born 1875. The Plumed Hat. c. 19p0. Drypoint. 10 7/8 x 7 7/8. A rich impression printed with drypoint burr on cream paper with full margins. Extensive pencil additions. Unsigned. The brimmed hat is decorated with plumes at the back. The print is housed in a black wood frame with a silver beaded lip. $275. Frederick Landseer Griggs, R.A., R.E. 1876-1938. St. Botolph's Bridge (No. 1). 1917. Etching. Comstock 19.iv. 5 3/4 x 4 1/2 (sheet 9 3/8 x 8 5/8). Edition 50 in this state (total 70 proofs in 4 states.) A rich impression with plate tone printed on 'KF' laid paper. Signed and annotated 'imp' in pencil, indicating a proof printed by the artist. Housed in a elegant 18 1/4 x 12 1/8-inch gold leaf frame. $1,850. Trenches at Gaza 1917. 1921. Watercolour. 14 x 22. Provenance: The Fine Art Society. Annotated 'Gaza 1917' lower left. Signed and dated 1921, lower left. Housed in a dramatic 22 x 29 3/4-inch gold and blue/grey frame. Mejdel Yaba. 20 September , 1918 Pencil, ink and watercolour on paper. 8 1/8 x 22. Annotated, upper left, "due N at ???' Dated on the ink drawing on the verso. Signed and dedicated on the front "To Paul from James McBey." Housed in an elegant French mat and an elegant 14 x 27 1/2-inch gold leaf frame with blue/grey highlights. $4,000. The Somme. 1917. Watercolor. 9 1/2 in x 18 3/4. Signed and dated, lower left. Annotated verso, 'Bapaume Road'. Housed in an archival mat and a 15 1/2 x 26-inch black wood frame. $5,500. Sub-Treasury Building, New York. March 10, 1930. Ink and watercolor on paper. 15 1/2 x 9 1/2. Signed, dated and titled in ink, lower right. The lower mat bevel is decorated to emulate cobblestones -- a charming touch. An elegant watercolor with bright, unfaded colors, in pristine condition. $3,500. Christopher Richard Wynne Nevinson, A.R.A. 1889-1948. Now Back the Bayonets. 1918. Lithographic poster, printed in red, black and yellow. 29 1/2 x 18 7/8 (image and sheet). Unobtrusive Vertical and horizontal fold marks; otherwise fine condition. An excellent impression with bright, fresh colors, printed on thin wove paper by Dangerfield Printing Co. Ltd, London. Signed in the stone.Housed in a 34 1/4 x 24 1/2-inch two-tone gold modernist frame. Price upon request. The Steam Launch, Chelsea Embankment. 1888-89. Etching. Hausberg 18. 3 1/4 x 4 3/4 (image and sheet). Edition about 30. Agnew's label verso. A rich impression with plate tone, printed by Roussel himself on off-white paper. Signed on tab "Theodore Roussel imp" in pencil. Housed in a reproduction frame that adapts part of Roussel's Stag and Flower Pattern Frame, Hausberg 164. Total frame size: 9 x 11 3/16. $1,250. Sir Frank Short, R.A., P.R.E. 1857-1945. Bromborough. A Cornfield by the Mersea. 1890. Etching. Hardie 250. 3 3/8 x 7 7/8 (sheet 4 5/8 x 9). Edition 50. A rich impression with subtle wiping, printed on cream laid paper. Signed in pencil. $275. Housed in a reproduction Hogarth frame (14 3/4 x 9 1/2) $375. Diana and Endymion (after the painting by George Frederic Watts, R.A., H.R.C.A. 1817 - 1904). 1891. Mezzotint. Hardie 60. 17 3/4 x 22 (sheet 21 3/4 x 25). Edition 300. A rich, tonal proof printed on Japan paper. Exhibited in 1900 at the Exposition Universelle, Paris, where it was awarded a gold medal.Signed in pencil by Watts and by Short. Signed in pencil by Watts and by Short. Housed in its original 28 1/2 x 32 1/2 x 1-inch period brown wood frame with a gold lip. $3,000. Hope (after George Frederic Watts, R.A., H.R.C.A. 1817 - 1904). c.1890. Mezzotint. Strange 236, Hardie73.i/ii. Image:19.1 x 15, Plate: 19 3/4 x15 5/8 (sheet: 22 1/8 x 17 3/4). Edition 250 in state i on Japan paper. A rich proof printed on Japon paper. Signed in pencil by Sir Frand Short and George Frederic Watts. Housed in an archival French mat and a 29 1/8 x 25 x 1-inch gold leaf frame. $3,000. Orpheus and Eurydice (after George Frederic Watts, R.A., H.R.C.A. 1817 - 1904). 1889. Mezzotint. Hardie 54.12 5/8 x 19 1/2 (sheet 17 1/8 x 23 3/ 8). Edition 300. A rich proof printed on Japon paper. Exhibited in 1889 at the Exposition Universelle, Paris, where it was awarded a gold medal. Signed in pencil by Watts, Short, and by the printer, Frederick Goulding. Housed in a 23 1/4 x 29-inch champagne gold leaf frame. $1,750. A Roman Canal [Lincolnshire] (after the water-colour drawing by Peter De Wint, 1784--1849). 1904. Mezzotint. Hardie 82.ii. 6 3/4 x 15 (sheet 15 4/1 x 22). Published by Robert Dunthorne. A fine impression printed in black on chine-appliqué affixed to white wove paper. $350. Housed in a black and silver wood frame $450. William Strang, R.A, R.E. 1859-1921. Alexandra of Denmark, Queen of England. c. 1912. Drypoint printed in colors. 21 3/8 x 13 3/4 (sheet 27 3/8 x 15 1/2). An excellent impression with subtle plate tone, printed on white wove paper. Signed in pencil. Housed in an elegant 28 1/2 x 21-inch gold leaf frame with a silk mat and a gold lip. $4,500. Lady Carnarvon. c. 1901. Drypoint. 15 1/8 x 10 1/4 (sheet 17 5/8 x 12 5/8). Slight toning and mat line; otherwise fine condition. A rich impression printed on white wove paper. Signed, numbered in pencil and annotated 'Tireé à 10, planche detruite' (10 impressions printed, plate destroyed). Edition 10, #3. Housed in an archival French mat and a 25 1/2 x 20-inch silver leaf frame. $3,750. Le Noeud Bleu (The Hat with the Blue Bow). c. 1905. Drypoint printed in four colors (black, brown, blue, red). Montesquieu 40. 21 x 13 (sheet 21/1/4x 13 1/4). Edition 80, # 6. A fine impression with subtle colors. Signed in pencil. Housed in a classic 28 1/2 x 21 1/2 -inch gold leaf frame with an archival French mat. This portrait of Miss Madeleine Dolley, a famous beauty, comedienne, and dancer from the Folies-Bergėre, is one of Helleu's most delightful images. $4,000. Automne (Autumn). c. 1938. Aquatint print in colors. Chapon/Rouault 288C. 19 1/2 x 25 1/2 (sheet 22 5/8 x 30 3/4). Edition 175, #58. Published by Vollard. A rich impression with bright, fresh colors printed on watermarked Montval paper, on the full sheet with deckle edges. Signed in ink, numbered in pencil. Housed in a silk mat and gold leaf frame (32 x 37). Price upon request. Qui ne se Grime Pas? (Who Does Not Wear a Mask?) A Self Portrait. 1923. Original etching with aquatint and mixed techniques over heliogravure in black ink. Chapon/Rouault 61c. Series: Miserere, plate 8. 22 3/16 x 17 (sheet 25 5/8 x 19 3/4). Intended for issue by Vollard c.1930 but not in fact issued until 1948. Printed by Jacquemin, published by Édition de L'Étoile Filante, Paris. in an edition of 425 (there were also 25 hors commerce copies). Printed on Arches laid paper, with the watermark Ambroise Vollard, with full margins and deckle edges. Signed and dated in the plate lower left. (No impressions in the published edition were pencil signed). Illustrated: Passeron, French Prints of the Twentieth Century; Hults The Print in the Western World. $5,750. "Obéissant jusqu'&à la morte et à la morte de la croix." (Phillippians 2.8). ("Obedient unto death, and to death on the cross.") 1923. Original etching with aquatint and mixed techniques over heliogravure in black ink. Chapon/Rouault 110b. 22 3/16 x 17 (sheet 25 5/8 x 19 3/4). Series: Miserere, plate 57. Intended for issue by Vollard c.1930 but not in fact issued until 1948. Printed by Jacquemin, published by Édition de L'Étoile Filante, Paris. Paris. in an edition of 425 (there were also 25 hors commerce copies). Printed on Arches laid paper, with the watermark Ambroise Vollard, with full margins and deckle edges. Signed and dated in the plate lower left. (No impressions in the published edition were pencil signed). $4,000. La Galerie du 'Calcutta' (Souvenir d'en Bal à Bord). 1898.Drypoint. Wentworth 25. 10 3/8 x 14 1/4 (sheet 14 5/8 x 19). Edition of 25 in Ten Etchings and 25 separate plates; total edition 50. A rich impression with drypoint burr printed on cream laid paper. Signed in pencil, lower left, and with the artist's red stamp (Lugt 1545) in the image lower right. Price upon request. Le hamac (The Hammock). 1880. Etching and drypoint. Wentworth 46. 10 5/16 x 7 1/4 (sheet 14 1/2 x 9 7/16). Edition of about 100. Illustrated: Calloway, English Prints for the Collector, p. 160. A rich impression with drypoint burr printed on cream laid paper with a partial Strasbourg Lily watermark. Signed in the plate and in pencil and and with the artist's red stamp (Lugt 1545) in the image lower right. Housed in an 21 x 17 x 2-inch carved classic colonial style gold leaf frame, $4,750. Printemps (Spring). 1878. Etching and drypoint. Tissot 30, Béraldi 27, Wentworth 34. 15 5/8 x 6 (sheet 24 x 10 1/8). Edition about 100. Slight mat stain; otherwise fine condition. A rich impression printed on cream 'Van Gelder Zonen' laid paper, onthe full sheet with deckle edges. Kathleen Newton, the artist's muse, wearing a ruffled muslin dress, is framed by flowering apple blossoms and rhodedendrons. Housed in a gold-leaf Whistler-style frame with a silk mat (Frame size 31 1/2 x 18). Signed in the plate, upper right. $7,500. Jane Avril. 1899. Brush lithograph printed in four colours from three stones. Delteil 367, Adhémar 323, Adriani 354.iii, Wittrock P29 B. 22 x 14 7/8 (image and sheet). Provenance: Far Gallery, New York; estate of Anna Eleanor Roosevelt (née Braman) Grasso, Essex, Connecticut. Mounted on Green's Lens Tissue Japanese paper. The red is attenuated; the other colors are bright. A three-inch profrssionally-repaired diagonal tear just to the left of the skirt; the lower right-hand corner repaired. With name of the printer, 'H. Stern, Paris'. Titled, dated and monogrammed in the stone. Price upon request. Omnibus. 1892. Etching. Asplund 72.iii; Hjert and Hjert 183.iii. 10 3/4 x 7 3/4 (sheet 17 5/8 12 1/2). Edition 75. "Extremely rare." Plate destroyed. Exhibited: Peintres-Graveurs Français, 1893. A rich impression printed on Van Gelder Zonen cream laid paper with a partial crown watermark, with wide margins. Signed in pencil. Housed in a stunning 23 3/4 x 19 3/4-inch beaded gold leaf frame. $9,500. The Waltz. 1891. Etching. Hjert and Hjert 178.iii. Edition 40 in this state (proofs in the first two states are "very rare"). 13 5/8 x 8 13/16 (sheet 16 1/2 x 12 3/8). Illustrated: Print Collector's Quarterly 1 (1911): 613; Salaman, Modern Masters of Etching, Zigrosser, Six Centuries of Fine Prints. AA rich impression printed on heavy cream-colored laid paper. Signed, inscribed and dated 1903 in pencil. Elegantly presented, housed in a silk mat wit a gold lip, and a 24 1/2 x 18 1/2-inch 22-karat gold leaf frame with fleur-de-lys on each corner. 15,000. Hope. 1961. Color dye stencil. 20 1/2 x 17 5/7 (sheet 25 x 23). Edition 50, #16. . Printed on (momogami) crumpled, hand-made paper on the full sheet with deckle edges. Signed, dated and numbered in white ink. $1,250 framed. Nativity. (A similar image with color variant from 1960 in an edition of 50 is entitled The Three Wise Men Visit Mary. 1961. Hand-colored dye stencil (Kappazuri). 21 1/2 x 24 1/8 (sheet 23 1/8 x 30 1/4). Edition 200, #27. Printed on (momogami) crumpled, hand-made paper on the full sheet with deckle edges. Signed, dated and numbered in white ink. Housed in a 29 x 32-inch wood frame with a gold metal front. $2,000. Arthur John Trevor Briscoe, R.E. 1873-1943. The Archibald Russell. 1935. Pencil and watercolour on watercolour board. 20 7/8 x 28 5/8. Excellent color and condition. Signed and dated in ink, lower right; titled verso. Housed in a gold leaf frame 28 1/2 x 36-inch gold leaf frame. $3,500. The Endeavour. c.1935. Pencil and watercolour on watercolour board. 14 3/8 x 20 7/8. Signed in pencil, lower right; titled in pencil, verso. $2,500. Sir David Young Cameron, R.E. 1865-1945. Glen Orchy. c. 1925. Watercolor, pencil and conte crayon on paper. 9 1/4 x 13 (sheet 10 3/8 x 13 1/4). Ex-collection L.G. Duke,purchased at Sotheby's, London '10.12.70'. Mat line; otherwise good condition. Signed and titled in pencil, lower right. Housed in a French mat within subtle wood and gold leaf 18 5/8 x 22-inch frame. $2,250. Souvenir d'Amsterdam. 1915-30. Etching and drypoint. Rinder 460.iv/vi. 14 5/8 x 10 1/4 (sheet 17 3/4 x 11 1/4). Edition 60. Illustrated: Print Collector's Quarterly 11 (1924): 53. A rich, tonal impression with atmospheric plate tone, printed on Japanese mulberry paper. Signed in pencil. Housed in a 21 1/2 x 16 1/2-inch gold leaf and wood frame. $1,250. The Wingless Chimera. 1911. Drypoint. Rinder 416.viii. 7 19/32 x 9 13/32. A rich impression with drypoint burr and plate tone printed on Japanese mulberry paper. Exhibited at the Royal Academy in 1911. Signed in pencil. The chimera sits on the neighboring buttress on Amiens Cathedral in Cameron's drypoint, The Chimera of Amiens Rinder 415. $750. Summer Landscape. c. 1920. Aqua-print (monotype). 14 1/2 x 17 1/2 (framed 24 x 27). Signed, lower left. Housed in a gold-lipped silk mat and gold leaf frame. $1,950. William Lee-Hankey, R.E., R.W.S., R.O.I. 1869-1952. Sorrow. c. 1920. Conte crayon and watercolor on watercolor board. 13 x 17. Signed lower right; titled verso. The subtle watercolor tones intensify the man's emotion; but the sunlight coming through the window suggests hope. Housed in a dramatic 23 3/4 x 28-inch modern silver leaf frame. $2,750. Three Generations. c.1919. Conte crayon and watercolor on watercolor board. 14 x 15 7/8. Signed in pencil lower right; titled verso. Housed in a complimentary green and beige mat and a 24 1/4 x 27 1/2-inch period gold leaf frame. $2,750. Greetings from 1. Holland Park Avenue, London. 1931. Ink and wash on tan wove paper. 3 1/2 x 3 1/4 (sheet 6 1/8 x 4 7/8 - visible in mat area). Signed, dated, titled and annotated 'XMas 1931' in ink. $1,500. Study for Ovation to the Matador (Hardie 110). Watercolor on paper. c. 1911. 19 1/2 x 12 1/2 ( image and sheet). A few unobtrusive foxing spots; otherwise excellent condition. A bright, fresh impression on watercolor paper. Signed in ink, lower right. Housed in an elegant gold leaf 27 1/2 - 22 1/2-inch frame, with French mat. $5,500. Moses Breaking the Tablet of the Law. c. 1860. Pencil drawing mounted onto paper. 12 1/4 x 3 3/4 inches. Collector's seal verso: Gustav Grunwald, (Lugt 1155b). Monogrammed 'DR' (Nagler 582), lower right. Housed in an archival French mat and a 20 X 11 1/2-inch carved wood frame. $1,750. Percy John Delf Smith, R.D.I. 1882-1948. Jerusalem 1931. Pencil, ink and watercolor. 9 1/4 x 15 (framed 18 1/2 x 24 1/2). Signed and dated in pencil. Housed in a carved gold leaf frame $1,750. Yuki no yougure. (Snow at Dusk). c. 1920. Watercolor on Japanese paper with a chrysanthemum watermark. 37 1/2 x 25 1/4. Original frame: 45 x 32. The shop on the right sells cigarettes. An extremely large and dramatic image in fine condition. Works by this short-lived artist are rare. Signed "E. Kato" lower right. $2,500. Viewing snow at Mount Matchi. (Matsuchiyama no yukimi.) Twentierh-century watercolor on silk after the c.1784 woodblock. 13 1/2 x 6 1/2 (image and sheet). Signed "H[iroshi]. Torii Kiyonaga" lower right. A man and two women stand in the snow outside a shrine; one woman carries an offering. $650. A silver frame is available.